Health promotion has been defined in a number of different ways and used in reference to a constellation of behaviors, such as eating, exercise, and stress management. For the purposes of this entry, we consider health promotion to be defined as strategies that (1) facilitate awareness of the benefits of, and opportunities for, physical activity; (2) enhance exercise motivation and skills; and (3) intervene to make environments supportive for active living. Within this definition is the explicit acknowledgment that both individual and environmental-level factors are related to health promotion. In this entry, we focus on health promotion strategies to increase exercise or physical activity that focus on individuals, groups, and specific settings. Strategies that are based on underlying theories appear to be more effective than strategies that are not. Social cognitive theories that include outcome expectations, control beliefs, and social influences are the typical underlying theories for individual level physical activity promotion interventions. Using these models, participants develop goals and plans to achieve these goals. This personal action planning is essential to many of the individual level interventions. Personal action planning can be useful in health promotion interventions targeting physical activity. Action plans allow the participants to focus on personally relevant motives as to why they should increase physical activity. For example, one person may list that engaging in an exercise routine will maintain or improve health while another may list the desire to stay young with one’s children. These personally relevant motives are directly related to the outcome expectations a person may have relative to a given behavior. Personal action plans also allow for the behavior changes to be goal directed, meaning a person may cite specific and measurable goals and activities to increase their physical activity. To overcome barriers that may decrease a person’s self-efficacy, or the belief in ability or competence to perform a certain action, a person may brainstorm ways to overcome obstacles that may impede personal goals. For example, if one cites not enjoying exercise because it is boring, that person may want to try different activities at the local YMCA until finding something stimulating. A personal action plan process works well to assist participants in resolving these issues. It is also a key tool in a goal setting and feedback loop that can be initiated between a participant and a health professional. There are a number of effective individual-level interventions that vary in the way they are delivered. It is clear that one-on-one counseling can be an effective method to increase physical activity and that the more frequent and longer duration of the intervention, the more likely it is to lead to behavior changes. One-on-one counseling has been done successfully using face-to-face methods, telephone methods—both live and automated— and, more recently through computer interactive sessions and mobile phones. The ALIVE! study provides a good example of an individual-level intervention that includes action planning. The study used a computerized program to motivate participants to increase their physical activity as well as a number of other behaviors. The intervention included assessing participants’ health behaviors and then encouraging them to set a goal in the area of greatest behavioral need (the behavior that they were currently not doing). Over the next three months, the program facilitated a series of small goals to provide participants with an opportunity to be successful before progressing to more challenging goals. During the program, participants received feedback on their accomplishments. The results of ALIVE! showed that people who participated in the intervention increased their physical activity more than those in a control group. Group-based interventions are those that use a group-dynamics approach to promote physical activity. It is important to distinguish between individual-level interventions that are delivered to an aggregate of people—like a group-education class—and a group-based intervention that includes strategies that consider the positive and negative forces that reside within groups and target those forces to enact behavior change. For group-based interventions, one of the driving concepts is that group cohesion is key in the process of behavior change and that three general areas of influence can be used to facilitate group cohesion. First, the group environment, which includes the sense of distinctiveness participants hold within the group and the size of the group, is thought to influence group cohesion and adherence. It appears as though the ideal exercise class size is 5 to 17 members, and the most common method used to generate a sense of distinctiveness is to create a group name. Some use games to create member proximity to remove barriers that are typical when people exercise together. Second, the structure of a group, including norms, roles, and even location of members within group meetings, facilitate group cohesion. Group norms are often developed through the public sharing of individual behavior and goals. Roles can be developed formally to aid in participants feeling a stronger responsibility toward the group (e.g., attendance tracker, warm-up leader) and participants can be encouraged to exercise in the same space at each group meeting to give a sense of belonging and fit within the group. Third, specific group processes that included communication, cooperation, and competition in the pursuit of a common group goal can enhance group cohesion. The common goal can be an aggregate of the individual goals of people within the group so that they feel accountable to the group. A group goal is critical and perhaps the most important aspect of group dynamics strategies to promote physical activity. When a physical activity promotion strategy includes components that focus on group environment, structure, and process, it will typically lead to large changes in behavior. In fact, when compared to individual interventions (with or without social support) group-based interventions lead to significantly larger changes. Interestingly, unlike individual-level interventions, group-based interventions seem to be effective regardless of the intensity and duration of the intervention program. Early research that focused on group based approaches typically used interventions that included three to five sessions per week over a 3 to 6-month period. These interventions were successful in improving adherence, outcome expectations, and control beliefs as well as increasing exercise participation. These types of interventions also demonstrated improved maintenance of exercise after the sessions were completed. At the other end of the spectrum, studies like Move More tested the degree to which group based interventions could increase and maintain physical activity with just two, 2-hour sessions spaced a month apart with the focus of the second session on increasing exercise once the program was completed. Move More targeted insufficiently active adult patients, and the participants were randomly assigned to either a group-based intervention, which used group dynamic strategies, or an enhanced-standard care group, which used social cognitive theory and a self-directed approach (action planning workbook, information on resources in the community, a follow-up telephone call). The results showed that although both interventions succeeded in increasing physical activity over the first 3 months, the participants in the group-dynamics approach were able to sustain and further increase their physical activity 6 months after the intervention ended while those in the enhanced-standard care group did not. The next sections discuss health promotion efforts across a number of different sites. In each case, individual-level strategies, group-based strategies, or both could be applied. As you will note in the examples below, site-specific interventions also regularly use social (e.g., policy changes) and physical (e.g., development of walking paths) environmental strategies to support physical activity. would be effective. Change teams made up of these key stakeholders received training on effective strategies to promote physical activity and implemented a number of different environmental strategies to improve student perceptions of connection, autonomy, skill building and healthy norms related to physical activity. The results of the Healthy Youth Places project demonstrated that students in the schools with change teams increased their physical activity over 3 years significantly more than those students in the control group. Like schools for children, worksites are the location that adults spend most of their waking hours. Worksite wellness has a long history because of the role of health in worker productivity and satisfaction. Worksites also provide a wide variety of avenues for intervention strategies (e.g., interpersonal relationships, group settings, organizational structure and policy). The Active for Life work-based physical activity intervention provides a good example of a typical approach for this setting. The intervention included changes to the physical environment in the form of posters and onsite health fairs and individually targeted materials in the form of regular newsletters, goal setting, self-monitoring, and incentives. It also included a group-based approach that was facilitated by site captains and included interoffice friendly competitions. The program reached about a third of the employees and lasted for 10 weeks. By the end of the intervention, the proportion of employees who were meeting the recommended guidelines for physical activity increased from 34% to 48%. However, 6 months following the intervention most of the employees had returned to a less active level. This lack of maintenance of physical activity change is common across health promotion strategies and provides an area in need of considerable research focus. Medical clinics have the potential for broad reach into the U.S. population. Furthermore, clinicians are considered credible and objective sources of health information for patients. 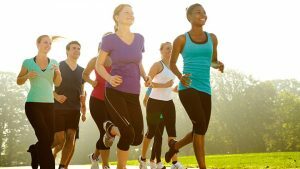 A number of researchers have attempted to take advantage of the credibility of physicians to promote physical activity. Unfortunately, it appears as though a simple prescription for physical activity is insufficient to initiate physical activity change. Some researchers have attempted to increase the amount of time that physicians spend counseling patients on physical activity and have also used techniques such as motivational interviewing. While there has been some success with these approaches in efficacy trials, there is limited evidence that physicians have the time necessary to even insert a 2to 3-minute counseling session for each patient that presents with a low level of physical activity. Where the most promise appears to be in regard to clinic-based physical activity promotion is at the intersection of health information technology and community resources. With the growing prevalence of the electronic health record and the push to include exercise as a vital sign, clinics have moved to the forefront as a location to identify people who could benefit from more physical activity. Still other researchers have shown that when physicians refer patients to a proactive community physical activity organization like the YMCA, the results are typically quite good in terms of increased physical activity. The rationale for intervening in faith-based institutions is not very different than some of the other place-based or settings-based interventions mentioned above. A large proportion of the American population attends a weekly faith-based service, and these services provide a great opportunity to promote physical activity. Just as with worksites, there are a number of different levels of potential intervention in a faith-based organization— sermons, socials, and service opportunities. Guide to Health provides a strong example of an effective intervention that was evaluated across 14 churches in southwest Virginia. The intervention prompted congregates to create weekly step-count goals, and when step counts were met, the future goals changed by an additional 500 steps. If a congregant failed to meet a weekly goal, helpful self-regulation strategies were used to help that person meet personal goals. The intervention was successful in initiating physical activity among congregation members. Dzewaltowski, D. A., Estabrooks, P. A., Welk, G., Hill, J., Milliken, G., Karteroliotis, K., et al. (2009). Healthy youth places: A randomized controlled trial to determine the effectiveness of facilitating adult and youth leaders to promote physical activity and fruit and vegetable consumption in middle schools. Health Education & Behavior, 36(3), 583–600. Estabrooks, P. A., & Glasgow, R. E. (2006). Translating effective clinic-based physical activity interventions into practice. American Journal of Preventive Medicine, 31(Suppl. 4), S45–S56. Green, B. B., Cheadle, A., Pellegrini, A. S., & Harris, J. R. (2007). Active for life: A work-based physical activity program. Preventing Chronic Disease, 4(3), A63. O’Donnell, M. P. (2009). Definition of health promotion 2.0: Embracing passion, enhancing motivation, recognizing dynamic balance, and creating opportunities. American Journal of Health Promotion, 24(1), iv. Winett, R. A., Anderson, E. S., Wojcik, J. R., Winett, S. G., & Bowden, T. (2007). Guide to health: Nutrition and physical activity outcomes of a group randomized trial of an Internet-based intervention in churches. Annals of Behavioral Medicine, 33(3), 251–261.